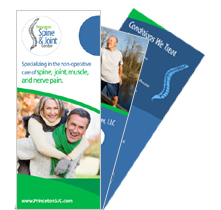 “I have been a patient of Princeton Spine & Joint Center for close to 10 years. My internist had referred me to the practice and I saw Dr. Cooper. I had issues with my lower back and certainly wanted to get it treated as quickly as possible without the need for any surgery. Fortunately my symptoms were not of the nature that required such a traumatic approach and Dr. Cooper was able to provide the treatment that was appropriate at the time. Since then I have been coming to this practice for a number of different reasons. Fortunately, none of which has resulted in any major medical problem for me, which I’m thankful for. I’ve seen a number of physicians here After having some of the lower back issues, I developed some problems in my knee, back issues recurred again and I saw Dr. Meyler. And more recently developed some issues with my shoulder. I am an avid swimmer and was concerned that I was doing damage or something because I was getting severe pain using certain motions of my of my arm. And in addition to that, trying to carry around a two and a month old grandchild with my arm was also probably creating some difficulty for me. So I made an appointment with Dr. Perlman who was relatively new to the practice and came in to see him. I was impressed with the thoroughness of his approach in attending to evaluate where my pain was coming from. We initially started out with an x ray, but then needed a more graphic description of the pain so we went with an MRI and it did reveal a more damage than we had originally thought. He spent a great deal of time just physically moving my arm around to see what I could do, what I could not do, and brought me over to the computer imaging so he could show me exactly where the problem was. The treatment he provided worked. I received a number of injections. The first one he gave me he said would take seven to 10 days to go into effect. And on the seventh day I called and said, ‘It’s not working”. So I came back in and received a second shot, but as it turned out on that 10th magical day the pain was gone. And I was going away on a vacation for three weeks so I was most gratified that had had worked. I have been extremely happy with the treatment I’ve received here. The physicians I’ve met with have been very approachable. They give you the time that you need to get your problem resolved. As I said, I was referred here 10 years ago or more by my internist to address the pain that I was experiencing in my lower back. I have the always referred to a Princeton Spine & Joint Center as my quote unquote pain management group. That this is the practice that I would call if I was experiencing pain in any part of my body that required some treatment. And so when I had lower back issues, when I had a joint issues with my knee, and then later shoulder problems, the first thing I thought it was going to the quote unquote pain manager group. I did not think that I needed to consider a surgical option until I saw Princeton Spine & Joint Center and that’s exactly what I experienced.